This issue is vexing me at the moment, as I am writing an article in the course of which I am reviewing the different versions of the quantity theory as an explanation of inflation. The following post is a work in progress, to help me summarise the history of the quantity theory. T = the volume of transactions of goods and services. where ΣpQ is the sum of the price multiplied by quantity bought of every good in the economy (Fisher 1911: 26). “We may, if we wish, further simplify the right side by writing it in the form PT where P is a weighted average of all the p’s [prices], and T is the sum of all the Q’s. P then represents in one magnitude the level of prices, and T represents in one magnitude the volume of trade.” (Fisher 1911: 25). II. 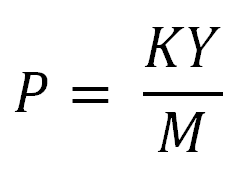 Cambridge Cash Balance Equation Versions(3) Alfred Marshall’s reformulation of the quantity theory as the cash balance approach in the 1870s. It is unclear to me whether Marshall already had an equation form of the quantity theory in the 1870s. 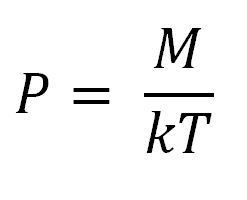 K = the proportion or fraction of real income which people hold in the form of money/cash balances. where P is the purchasing power of money. But where this was given in Marshall’s works is not yet clear to me. It seems that the final form of Marshall’s version of the Cambridge Cash Balance Equation was given in his book Money, Credit, and Commerce (1923). M = aggregate money stock or money supply. (5) J. M. Keynes’ version of the Cambridge Cash Balance Equation in A Tract on Monetary Reform (1923: 77). p = the index number of the cost of living. At the time he wrote A Tract on Monetary Reform Keynes had no doubts about the truth of the quantity theory (Keynes 1923: 74). (6) Marshall’s final formulation of the Cambridge Cash Balance Equation in Money, Credit, and Commerce (1923). T = the total amount of goods and services purchased. and this seems to be Dennis H. Robertson’s version. 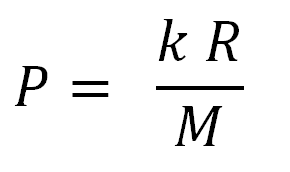 The variable k was held to be equivalent, but superior, to Irving Fisher’s “velocity of circulation” concept V (which is why it is held that 1/k = V), because, unlike V, k is supposed to be empirically measurable. “In my present state of mind, however, I doubt that either version of the Cambridge equation is of any serious utility, and I can’t remember that I have ever come across a case of anyone ever using either of them for practical purposes of interpretation. Thus, whether my version is slightly better than yours, or whether I ought to yield to your criticisms, I am not prepared to put up a serious case in defence of either. All this section is really a survival of the time when I was trying to make some practical use of the Cambridge equation, an attempt I have long since given up.” (Keynes, Letter to Dennis Robertson, 3 May, 1933 in Keynes 1971: 18). “An algebraic statement of the equation of exchange was made by Simon Newcomb in his able but little appreciated Principles of Political Economy, New York (Harper), 1885, p. 346. It is also expressed by Edgeworth, ‘Report on Monetary Standard.’ Report of the British Association for the Advancement of Science, 1887, p. 293, and by President Hadley, Economics, New York (Putnam), 1896, p. 197. See also Irving Fisher, ‘The Role of Capital in Economic Theory,’ Economic Journal, December, 1899, pp. 515-521, and E. W. Kemmerer, Money and Credit Instruments in their Relation to General Prices, New York (Holt), 1907, p. 13. While thus only recently given mathematical expression, the quantity theory has long been understood as a relationship among the several factors: amount of money, rapidity of circulation, and amount of trade.” (Fisher 1911: 25, n. 2). Dimand, Robert W. 2002. “Patinkin on Irving Fisher’s Monetary Economics,” The European Journal of the History of Economic Thought 9:2: 308–326. Fisher, Irving. 1911. The Purchasing Power of Money: Its Determination and Relation to Credit, Interest and Crises. The Macmillan Company, New York. Friedman, Milton. 1956. “The Quantity Theory of Money: A Restatement,” in Milton Friedman (ed. ), Studies in the Quantity Theory of Money. The University of Chicago Press, Chicago. 3–21. Friedman, Milton. 1968. “Money: the Quantity Theory,” in D. Sills (ed. ), International Encyclopedia of the Social Sciences (vol. 10). Macmillan Free Press, New York. 432–447. Keynes, John Maynard. 1971. The Collected Writings of John Maynard Keynes. Volume XXIX. The General Theory and After. A Supplement (ed. by D. Moggridge). Macmillan, London. Marshall, Alfred. 1923. Money, Credit, and Commerce. Macmillan, London. Marshall, Alfred. 1926. Official Papers (ed. by J. M. Keynes). Macmillan, London. Newcomb, Simon. 1885. Principles of Political Economy. Harper, New York. Pigou, A. C. 1917. “The Value of Money,” The Quarterly Journal of Economics 32.1: 38–65. Robertson, Dennis Holme. 1928. Money (rev. edn.). Nisbet, London. Robertson, Dennis Holme. 1964. Money (rev. edn.). University of Chicago Press, Chicago, Ill.
"k or kd = the amount of money held as cash or money balances or the demand to hold money per unit of money income"
The latter part of that statement seems odd to me. Surely only when we join k up with P.Y we get "the demand to hold money per unit of money income". k alone does not seem to me to have this definition. Finally, I am with Keynes: the quantity theory is useless. Unless we assumed fixed V or k then it tells us nothing at all. The only point in laying it out is really to knock it back down. Thanks -- I have fixed the definition of k.
"inflation -- or changes in the general price level -- are not explained by the monocausal and mathematical quantity theory. In an endogenous money world, although monetary factors play a role, changes in individual prices that cause inflation/deflation can also be driven by independent non-monetary causes, such as supply side factors, costs, wages, demand factors, without being driven by imagined exogenous money supply changes."? Yes. Majority are probably wage inflations though. The full quote suggests that Friedman had a slightly more sophisticated view of inflation than post-Keynesians would have us believe. It stands to reason that he would admit that negative supply shocks, oil disturbances could cause inflation . But in the absence of government supply restrictions, such an increase in the price level would quickly peter out. That would be what someone like him would say. Phil, wage inflation IS demand push inflation. Wages are typically part in nominal income, which is a measure of MV. Lets perform a simple thought experiment as to why endogenous money theory is nonsense. Let us say that the uk or us central bank freezes production of M0 base money (currency plus reserves. In the US. case the United States Bureau of Engraving and Printing physically prints the notes, but at the behest of the US Federal Reserve.) The central bank sees an asset price boom in place, and is fearful of a bubble even though inflation is under control. It doesn't want to raise interest rates, but it doesn't want the boom to continue either, so it simply holds the line, neither selling securities nor buying them slowing the monetary base growth to absolute zero. Now what do you think would happen? So what you are saying is that, if an endogenous money system did not exist, then... it would not exist? That is hardly a refutation. Seriously, just consider how your comment is incoherent. You are saying on the one hand: "endogenous money does not exist! ", but at the same time, "well, if the endogenous money system that **actually functions now** did not function, then we would not have endogenous money!" You are an seriously the most LITERAL person Ive ever blogged at., LK. I'll spell out what's implied in my posts. Endogenous money theory, as espoused by the Post Keynesians considers the role of the central bank to be trivial and private credit to be where the action is. While they are right on the surface, they are wrong on the deeper significance. Cash does NOT have to be lent out à lá money multiplier for it to be important. Cash and reserves are important for precautionary and liquidity preference motives. (In a bank run and when people stand on line panicking in front of ATMs) Since the central bank controls both, it follows that the central banks's role is still important. Have I sufficiently clarified the market monetarist counter-response to the Post Keynesians? Is there any literature on that? Books, articles ect?